On 1 September 2017 near 12:06 UT the Amor class Near Earth Asteroid (3122) Florence made a relatively close approach to Earth. 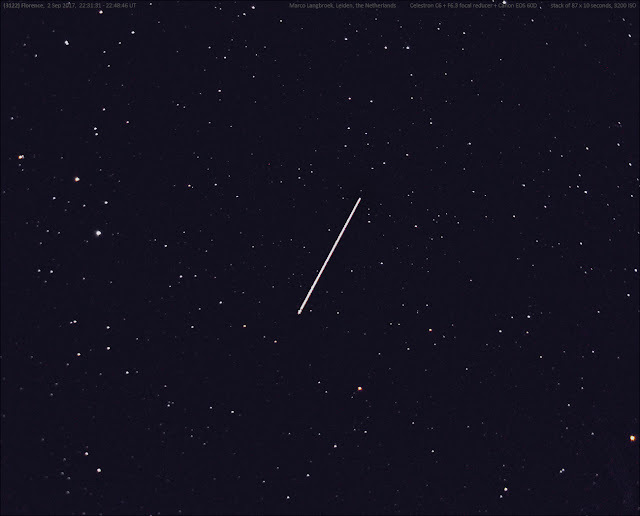 The nominal pass distance, 0.047 AU or about 18 Lunar distances, was a safe distance. It does not often come this close: the asteroid had last been about similarly close in 1930, and will not be really close again until 2057. (3122) Florence is one of the more rare larger NEA's. It is about 5 km in diameter and currently has a theoretical MOID (Minimum Orbit Intersection Distance) of 0.044 AU, only slightly less than the pass this year. While this is a safe distance for now, orbital disturbances in the (distant) future could bring it closer, and the size of the object is such that it would be of future impact concern. It is therefore on the PHA list, where PHA stand for "Potentially Hazardous Asteroid" (for some reason, I always make "Potentially Hostile Asteroid" of this in my mind, probably because of the similar "Potentially Hostile Aircraft"). (3122) Florence became quite bright during this close pass, and was visible in binoculars at a maximum brightness of about magnitude +8.7 just before the moment of closest approach. 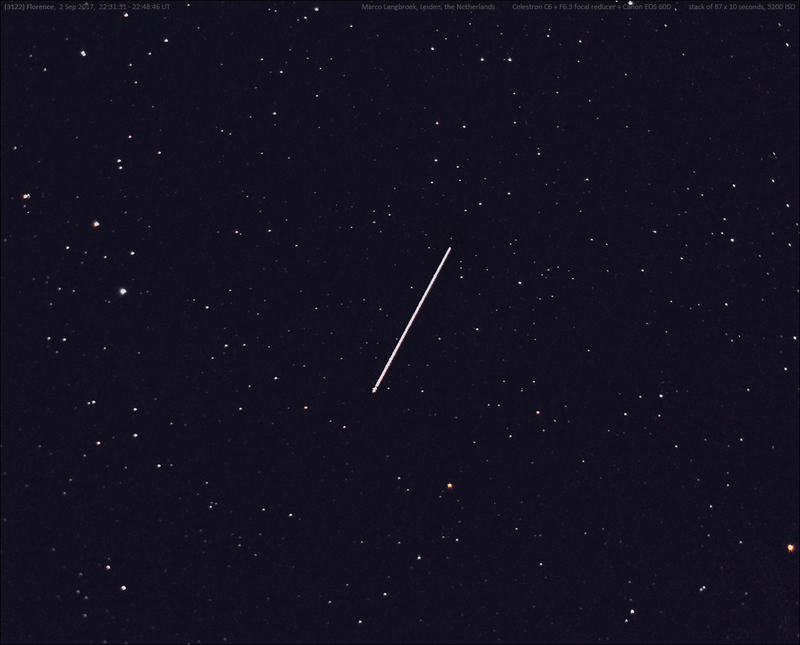 About 1.5 days after the moment of closest approach, near local midnight of September 2-3, I imaged the fast moving asteroid from Leiden with my Celestron C6 telescope. It was about mag +9.1 at that time. The movie above, and the stacked image below, was made from 87 images (each an exposure of 10 seconds with a 5 second interval) taken over a 17-minute period between 22:31:32 - 22:48:47 UT (Sep 2). The asteroid was at a distance of 0.048 AU at that time and moving fast through Delphinus, at an angular speed of about 22".5 per minute. The equipment used was a Celestron C6 (15 cm) Schmidt Cassegrain telescope with F6.3 focal reducer, and a Canon EOS 60D DSLR at ISO 3200 in the prime focus of the telescope.